•	FoMu (655 Tremont St., Boston): FoMu arrival in Boston’s South End has been met with fanfare, proving even those with food allergies or intolerances have no excuse to skip dessert! Its plant-based, gluten-free, dairy-free product might have you thinking, “what’s the point?” Rest assured: FoMu tastes just as good if not even better than the real deal, and this author is picky with his ice cream! •	J.P. Licks (150 Charles St., Boston): Take a break exploring Beacon Hill (the closest J.P. Licks to Seaport) and pop into this local favorite known for its funky cow design as much as its delicious flavors. Its “Lickwiches” are new to the menu and have quickly become a staple. 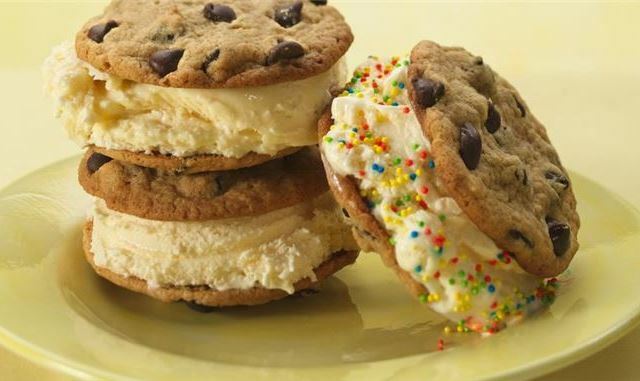 Fresh vanilla or a monthly flavor special are sandwiched between two fresh chocolate chip cookies. It’s mooooore than enough! •	Lion’s Tail (354 Harrison Ave., Boston): The South End’s newest cocktail bar might be the place to go for happy hour (and we certainly do not discourage that), but add an artistic ice cream sandwich to the next round of tequila! French vanilla, ganache, and massive chocolate chip cookies deliver an upscale creation to share with a friend…or maybe you should just each have your own. •	Toscanini’s (899 Main St., Cambridge): Head across the Charles on the Red Line to Central Square and see what all the MIT fuss is about. Toscanini’s has been a neighborhood staple for 27 years and features 35 ever-changing flavors like goat cheese brownie, green tea, and chocolate graham soft serve. Two fresh cookies and the flavor of your choosing make this one avant-garde ice cream sandwich.